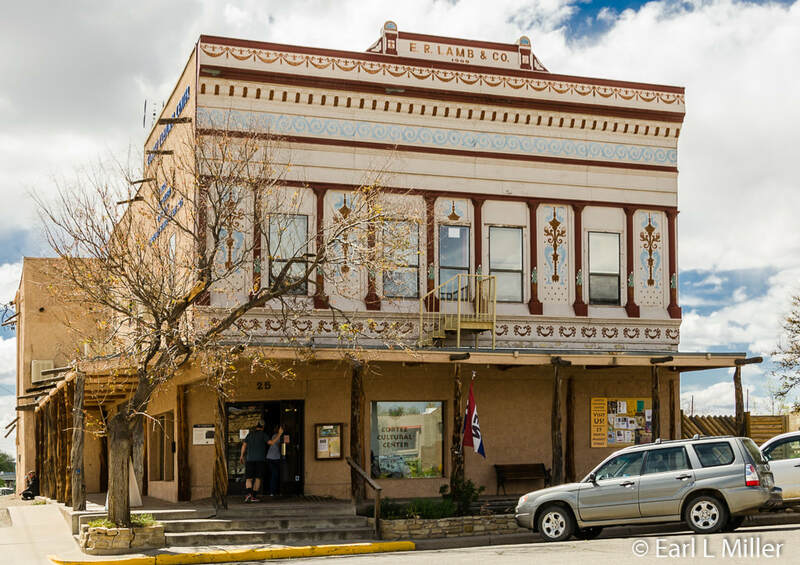 Near the Four Corners area of Colorado, visitors find Cortez, a town of approximately 9,000 population, in Montezuma County. Located in the middle of the most archaeologically dense region of the country, it’s one of the gateway towns to Mesa Verde, located 9 miles away, and home to several of its own attractions. Numerous restaurants range from family and sports bars to Asian and barbecue. Many of the chain motels have rates less than $100 a night. Three campgrounds are within Cortez’s city limits including a KOA. Other campgrounds are nine or more miles from this town. A first stop should be the Colorado Welcome Center. Being only 35 miles from the Four Corners of Colorado, Utah, New Mexico, and Arizona, it serves as an information center for all of these states. Friendly staff will answer your questions and provide you with the brochures and maps you may need. 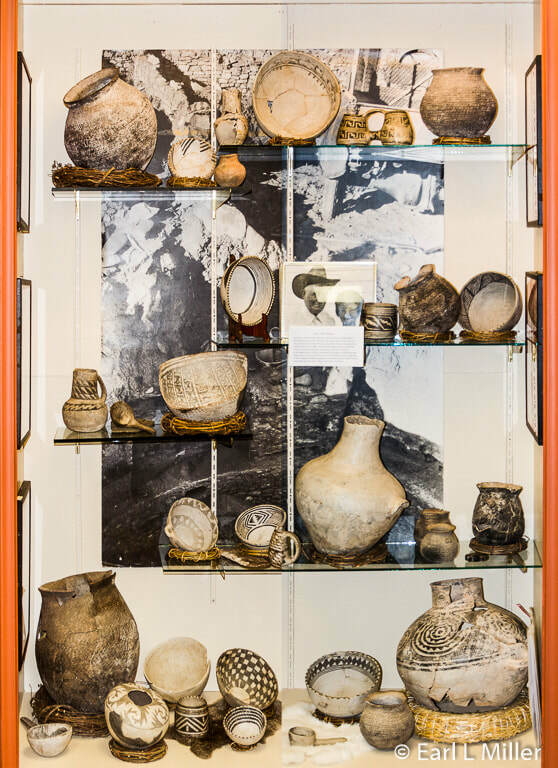 Visitors can view a small collection of Ancestral Puebloan artifacts at the combination gift shop/bookstore run by the Mesa Verde Museum Association. It’s a nonprofit organization supporting education, interpretation, and research at Mesa Verde National Park since 1930. In addition, the bookstore sells Mesa Verde tour tickets of Cliff Palace, Balcony House, and Long House at $5 a person. It’s the same price as purchasing them at Mesa Verde National Park without standing in line. Tickets can be purchased in person up to two days in advance of taking the tour. Keep in mind that all of these adventures are strenuous. Other conveniences include restrooms, free coffee, and free internet access. Sit in their kiva to watch Division of Wildlife videos or the City of Cortez’s informational channel. If you don’t want to eat at a restaurant, picnic at one of the Center’s sites. You might spot some of the local ducks wandering through. Rvers have ample room for parking. Colorado Welcome Center at Cortez is located at 928 E. Main Street in Cortez. Their telephone number is (970) 565-4048. Daily hours of operation are Memorial Day to Labor Day: 8am-6pm; Labor Day to Memorial Day: 8am-5pm. The Center is closed Easter, Thanksgiving, Christmas, and New Year’s Day. Housed in a 1909 building that was once the E. R. Lamb Mercantile, the Cortez Cultural Center was founded in 1987. Its mission is to provide for its community’s interests whether they are artistic, cultural, educational, or historic. It does this by several means. It maintains a home for area artists, cowboy poets, archaeologists, and musicians. Visitors can tour its combination art and history museum. During the summer months, it provides free Native American dances in its courtyard. Lectures, slide shows, and music programs occur from September through May. The Center’s interior is one large room with exhibits lining the walls. Its highlight is its wealth of information on archaeology and Native American culture. 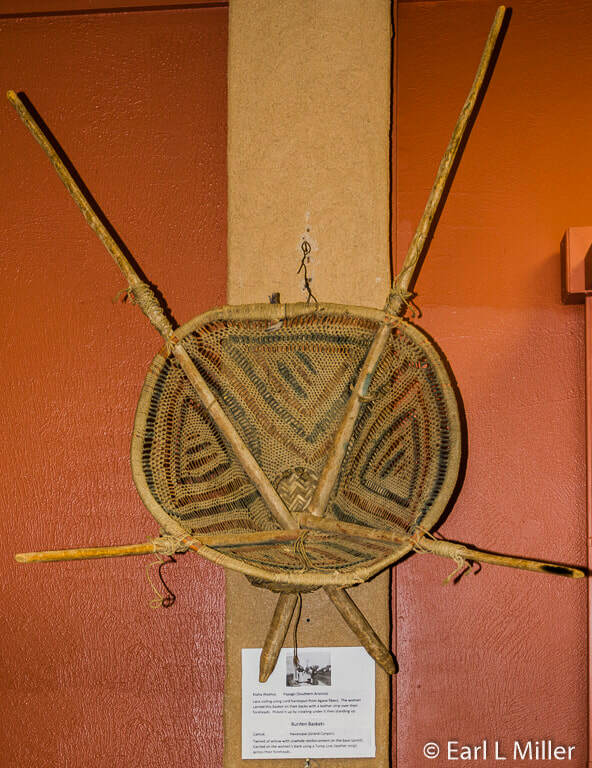 You can view interpretative exhibits on the Basketmaker and Pueblo periods of the Ancestral Puebloans. At their peak, between 500 and 1300 AD, between 40,000 and 50,000 people lived in the area that is now Montezuma County. Although Mesa Verde has the reputation as the place to see historic cliff dwellings and pit houses, only 4,000 people lived in what is now the park. Now 25,000 reside in the county. At first, the people were nomadic hunters and gatherers before becoming agriculturalists. They later raised corn, beans, and squash, domesticated the turkey, and hunted game. They were known for their building techniques. They started as basketmakers but made the transition to becoming highly skilled black on white potters between 600 and 700 AD. Their beautifully decorated bowls, ladles, mugs, and other ceramic items have been located throughout the region. Many are on display at the Anasazi Heritage Center in Dolores and the Chapin Mesa Archaeological Museum at Mesa Verde National Park. 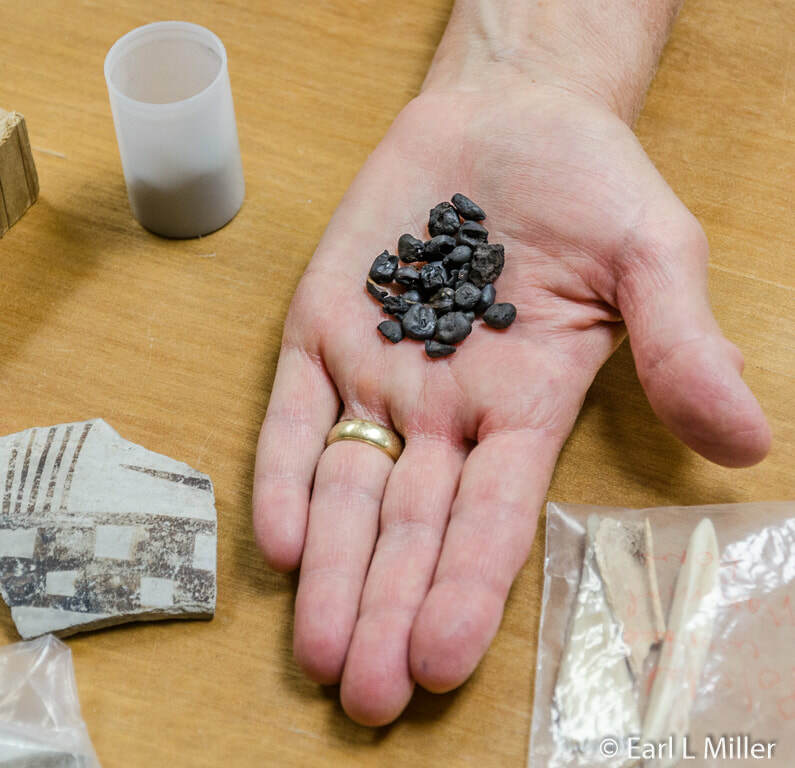 Two cases of the Center’s pottery are a small part of the Anasazi artifacts Joe P. Fulk collected at his farm at Goodman Point between 1925 and 1975. Fulk found the items when he farmed his land in west-central Montezuma County. Many of the ceramic artifacts were plowed up. Evidence consists of plow marks and some repaired pieces. He excavated others on sites he knew had been uncovered by the plow. In 1953, University of Colorado archaeologists became involved in evaluating his acreage. They estimated that there were 27 sites of various types and ages on his 320 acres. They made a general survey of the area’s private farmland, dug several test trenches, and excavated one kiva and one large surface ruin. 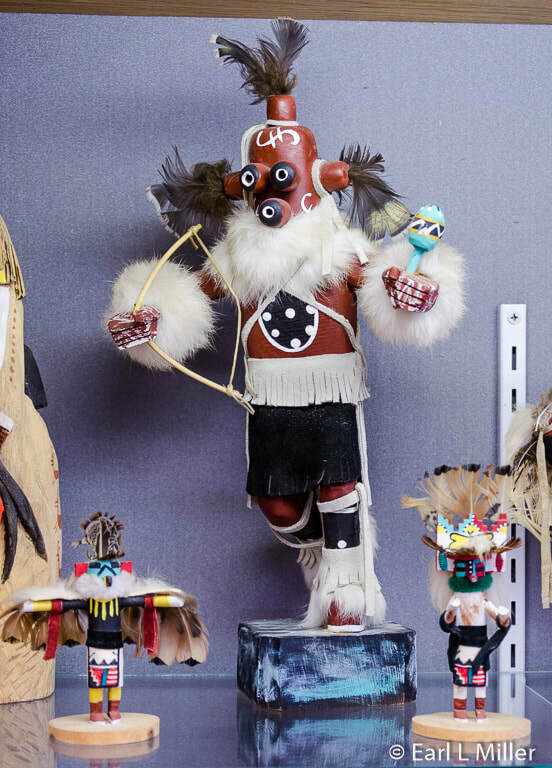 Other Native American artifacts are on display as well. You can see the clothing and blankets of Navajos. Check out the Ute case with the vest, papoose carrier, and headdress. 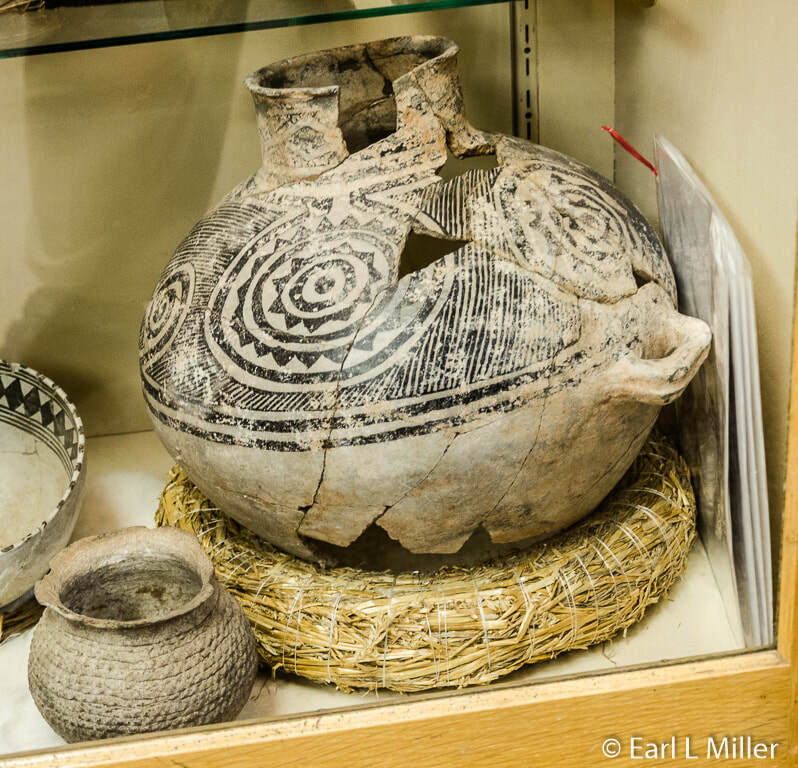 Ute Mountain Pottery and Papago and Havasupai baskets are also exhibited.. In a corner you’ll notice what early settlers may have used. 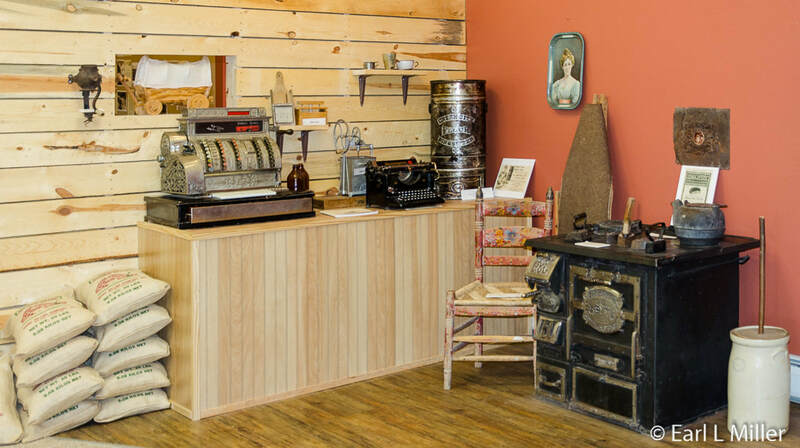 You’ll see a cash register, typewriter, and stove. A large case contains shoes, lacework, hats, and silverware. Another display is on ranching and contains a saddle and horseshoes. The county has lots of long-standing Hispanic families who have ranches. Farming is also still being done with hay, pinto beans, and Anasazi beans. 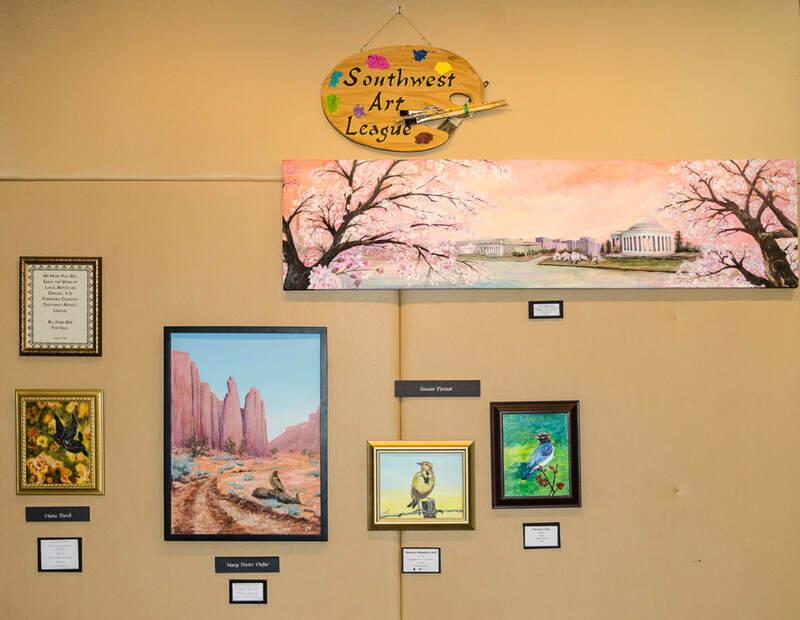 On two walls, you will find hanging paintings of local artists sponsored by the Southwest Art League. The theme changes monthly. In May, it was all bird pictures. We saw a temporary exhibit on bringing water to the valley. In September, this display will be replaced by one on the community’s Latino heritage. Inside the building, you will also find a large gift shop. It has paintings, jewelry, Kachina dolls, pottery, and glass hangings for sale. You can also purchase corn and Anasazi beans. Take time to view the north side of the Cortez Cultural Center. 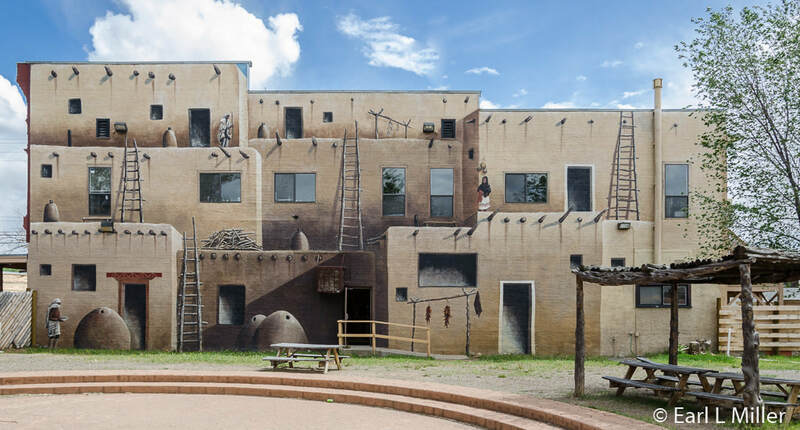 You’ll find a mural of a Puebloan village that was designed and painted by Buford Wayt. He was older than 70 when he painted it. Wayt was active in the arts through the field of education where he concentrated on music with painting as a sideline. He was principal of a Cortez elementary school and junior high school. He was Director of the International Center (which he created) at Fort Lewis College in Durango, Director of Curriculum and Instruction for Cortez Schools Band, Choral Director for Montezuma County’s RE-1 Schools, and the Durango High School Music Director. He was active in the community as well. He was a member of Cortez Cultural Center’s first board and active in its programs until his death. He also started the Cortez Choral Society, the Choralaires, and the town’s American Legion Drum & Bugle Corps. In 1997, he won the Colorado Governor’s Award in the arts sponsored by the Colorado Council on the Arts. You will find a Navajo hogan in the courtyard that you can enter and explore. Male or fork-lip hogans are ceremonial, for events like weddings, and are sacred to the Navajo. They contain a vestibule in the front and resemble a pyramid with five triangular faces. Female hogans are traditional structures that include the summer shelter, the underground home, or a house. They can still be found in rural areas or on reservations. They are circular, much larger, and don’t have a vestibule. 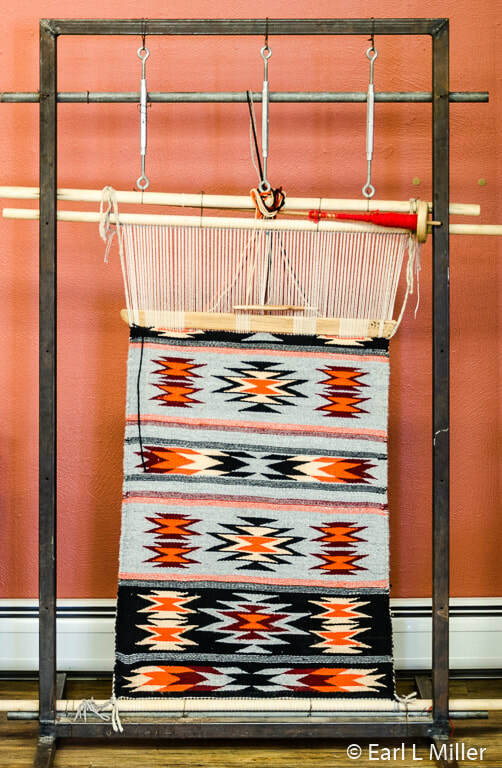 In the early 1900's, the Navajo started making hogans in a hexagonal or occasionally octagonal shape. This allowed for wooden crossties to be laid horizontally to form the walls of a larger, taller home. They are in the shape of a female hogan but with much more room inside. Today’s hogans are usually about 23 feet in diameter. Unfortunately we were in town too early in May to see their free Ute dances offered in 2017 at 7:00 p.m. between May 30 and September 2 every night except Sunday. Two different troupes from Towoac, the reservation of the Mountain Utes, perform. It can range from two to ten people depending on how many are available on a particular evening. After the dances, participants answer questions about their culture. The Center also owns Hawkins Preserve, a 122-acre natural and cultural preserve with Cortez. It’s open to the public year round. Hikers will find several trails throughout this natural desert setting. 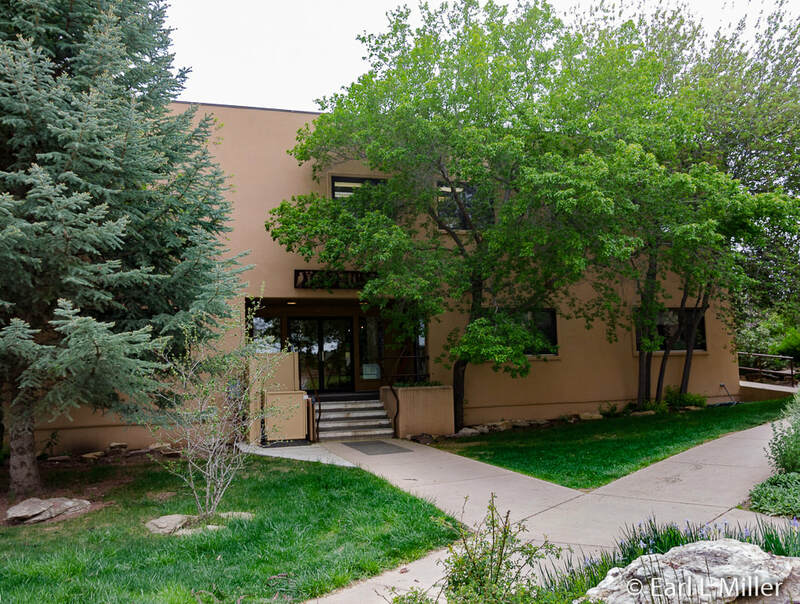 It’s located at 1490 S. Cedar Street and its telephone number is (970) 565-1151. You will find Cortez Cultural Center at 25 North Market Street. Their telephone number is (970) 565-1151. Hours are Monday through Saturday 10:00 a.m. to 5:00 p.m. Admission is free though donations are accepted. 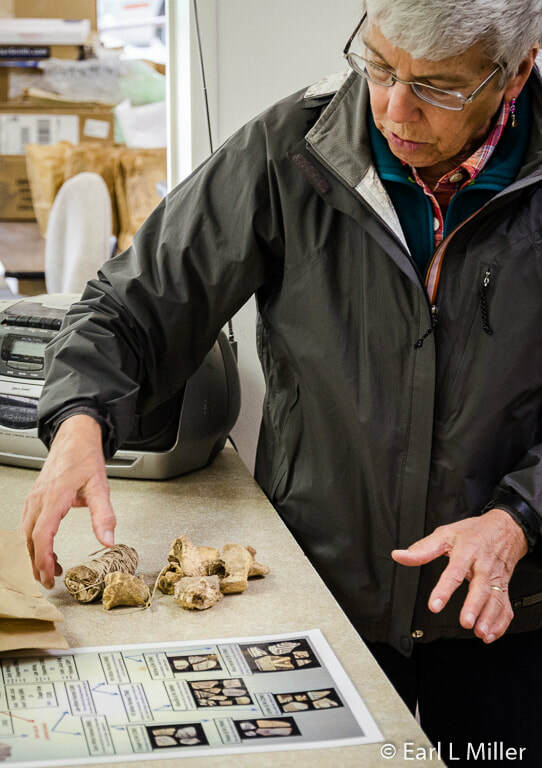 Before traveling to Mesa Verde, visitors might want to visit Crow Canyon where you can obtain an understanding of the archaeological process. It’s on a 170-acre campus about four miles northwest of Cortez. 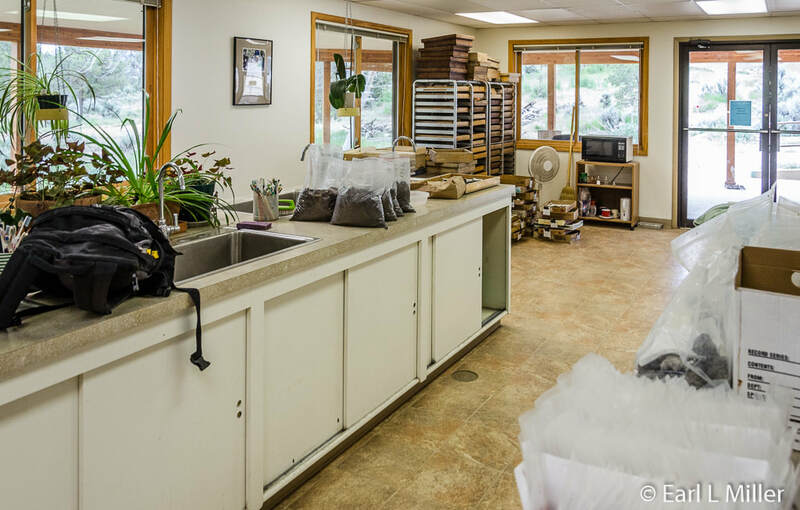 The mission at this not-for-profit center consists of three parts. The first is conducting archaeological research and being on the cutting edge of this science. The research head is Mark Varian who has given symposiums at such places as Chicago’s Field Museum, the Smithsonian, and the Denver Museum of Nature and Science. The second is conducting education programs and tours for those from fourth grade to 92 year olds. They do this by holding one to five day classes where those attending can have hands-on experiences with the excavation of Native American sites while learning archaeological techniques. The third is to partner with the American Indians who are descendants of the people who lived here over a thousand years ago. Advice is sought on everything from research design to curriculum development and additional outreach. 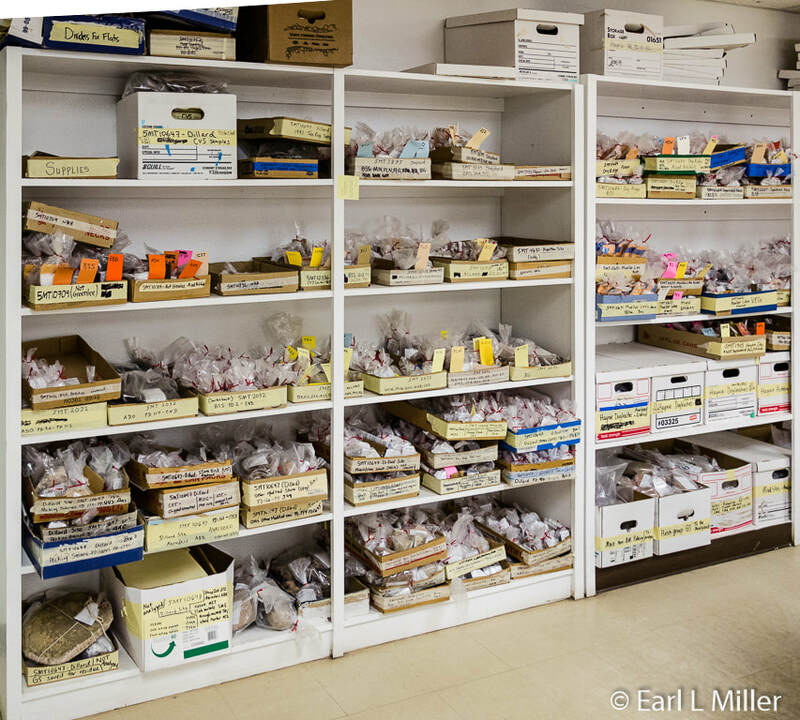 Facilities include the Gates Archaeology Laboratory housing classrooms, education and research laboratories, offices, and a small gift shop. A lodge, containing the dining hall and a lounge, six cabins built in 2015 and ten rustic cabins, modeled after Navajo hogans, are also on the property. A replica of an ancient pithouse and a reconstructed pueblo farmhouse overlook the campus from opposite hillsides. The Center’s creation was due to Edward F. Berger, who was a history teacher with the Cherry Creek Schools near Denver, Colorado. He brought students to southwest Colorado with the idea of involving them in programs that accelerated their learning and increased their motivation. 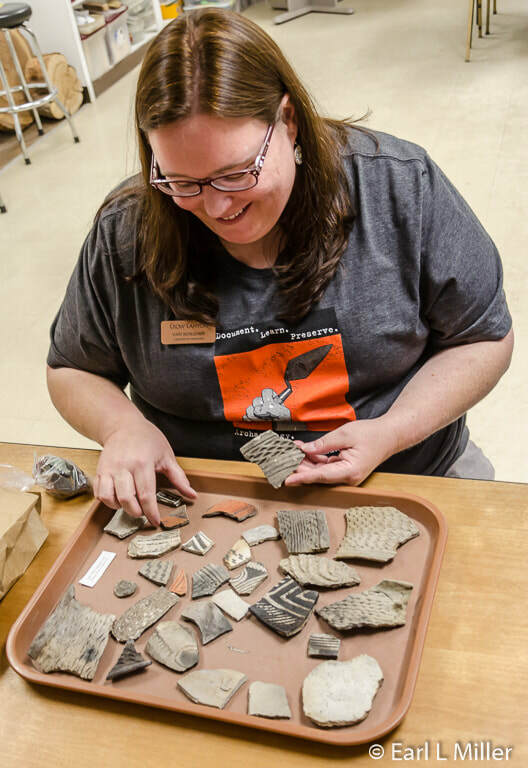 Archaeology became part of the curricula because of southwest Colorado’s rich ancient history. 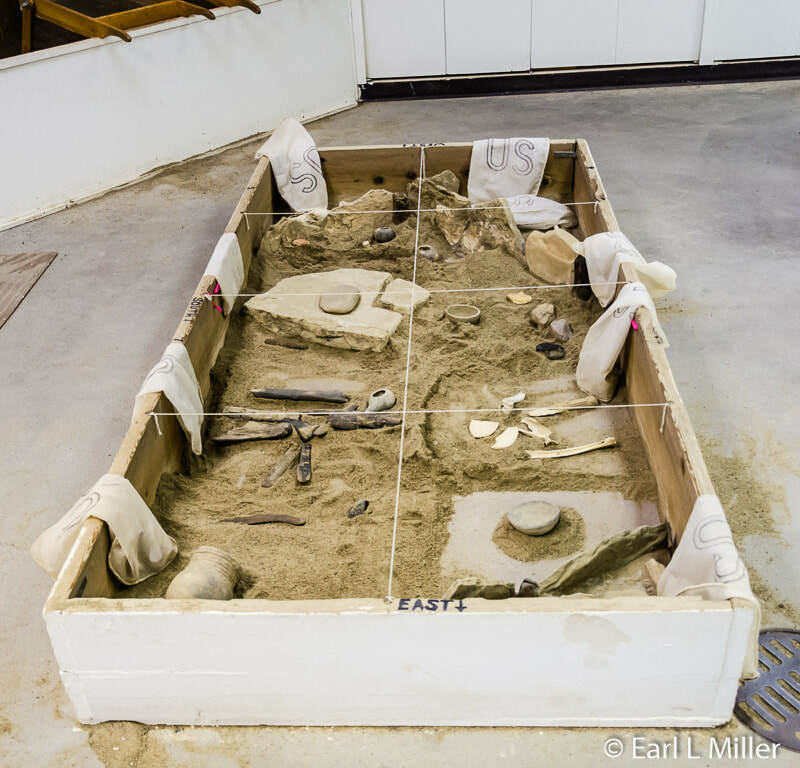 He worked with Dr. Art Rohn’s graduate students from Wichita State University in Kansas to teach and supervise high school students with doing original research excavating ancient pueblo sites. In 1972, Berger wrote the program that started Crow Canyon. Then it was called I-S Education Programs. He purchased, in 1974, 80 acres of land in Crow Canyon and started developing an 80-acre campus. Joined by his wife, Joanne, from 1975 until 1986, he pioneered new effective learning and teaching techniques. Education expanded to all age groups. Dr. Ron Gould was the first staff archaeologist and teacher. The group worked in conjunction with the Mountain Ute tribe to develop Native American programs at Crow Canyon as well as a relationship between the two neighbors. Crow Canyon became well known by the 1980's for their educational programs and archaeological research. To free them of their 24/7 responsibility and to increase their finances, the Bergers contacted the Foundation for Illinois Archaeology (FIA) at Kampsville, Illinois. At that institute, Clark Hinsdale was building an educational component to his program. They spoke to Professor Struever at Northwestern University who headed the FIA. By 1983, the two nonprofit firms had merged with the name changed to American Archaeology (at Northwestern University.) A new lodge to house 40 students and a new laboratory were built. It also led to the hiring of additional research archaeologists, and the Bergers identifying two major sites for research - Sand Canyon Pueblo and the Duckfoot site. In the spring of 1986, Jo and Ed Berger resigned their positions as executive and associate directors. Archaeologists conducted excavations between 1984 and 1993 and found one of the largest sites in the Mesa Verde area. They estimated 500 people lived at Sand Canyon between 1250 and 1280. They discovered 420 rooms, 90 kivas, 14 towers, an enclosed plaza, and a D-shaped biwall building. Sand Canyon is now part of the national monument of Canyons of the Ancients. One of Crow Canyon’s multi-year research projects is the Pueblo Farming Project. Since 2006, Crow Canyon staff has documented Hopi farming practices and the cultural contact in which they take place. The Hopi grow corn, beans, and squash replicating their farming of a thousand years ago. They come in the spring to plant and in the fall to harvest. There are two tours you can take. One is a free hour tour offered every Wednesday, Thursday, and Friday at 10:00 a.m. from June through September. 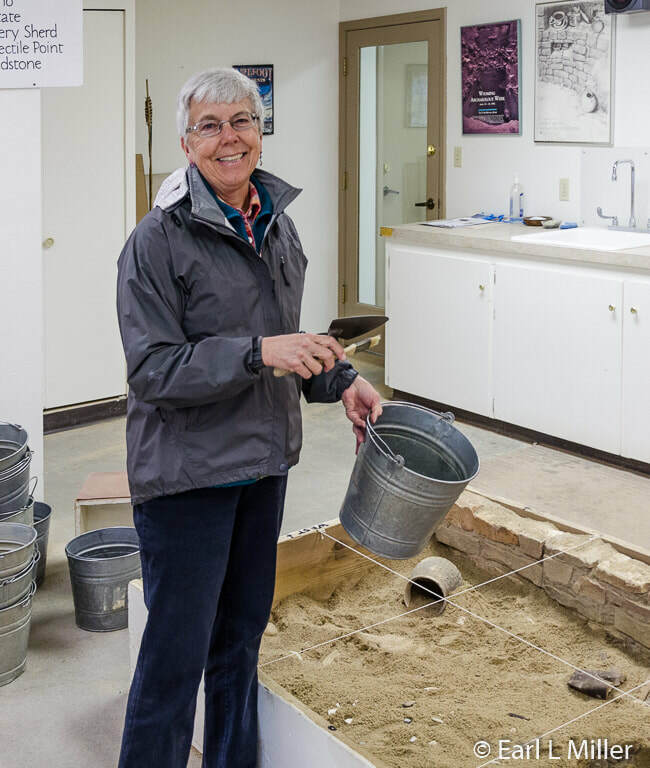 It includes visiting the archaeology laboratory to see how artifacts are documented and stored as well as the opportunity to handle some of the Ancestral Puebloan artifacts. Visitors learn about the work of field and lab archaeologists and how Crow Canyon works with the Utes. This tour is free. 8:45 a.m. - Tour begins from the Gates Building lobby. Note that the activities and schedule can be subject to change. Reservations can be made by calling (800) 422-8975 ext. 146. Crow Canyon also offers week-long excavation programs and cultural explorations focusing on the Southwest’s most significant cultural sites. The cultural explorations for 2017 involve travel to such places as Chaco Culture National Historic Park in New Mexico, Bears Ears National Monument in Utah, and the Channel Islands in California. These occur from June through October. They also offer summer camps at Crow Canyon for learning about archaeology. To learn more about these programs, go to their web site. The first stop was the Sand Room where sand pits are filled to the top. Here students learn how to use a trowel, paint brush, tape measure, and bucket. As they discover artifacts in the sand boxes, they record their notes in a notebook. Each of the three pits represents different time periods. Middle school students do work in the classrooms and labs while adults and high school ncamps go out in the field. Field sites have changed over time. As of 2016, they have been working at the Haynie Site on private land. The tour then visited the Water Lab where artifacts are washed with toothbrushes to clean off the dirt then put in paper bags. Information on each bag has the study unit, exact location, depth, date, contents, and supervisor’s initials. Each also has the site printed. All sites have unique numbers. The key is to establish a site, register it, and lay out a grid. Since 2016, drones have been used to help with site assessments. Archaeologists are interested in what animals the bones are from and how old they are. Jeanne Becker, our guide, showed us animal bones they found. Crow Canyon doesn’t excavate human remains. The third lab we visited is the home of the computers and microscopes. 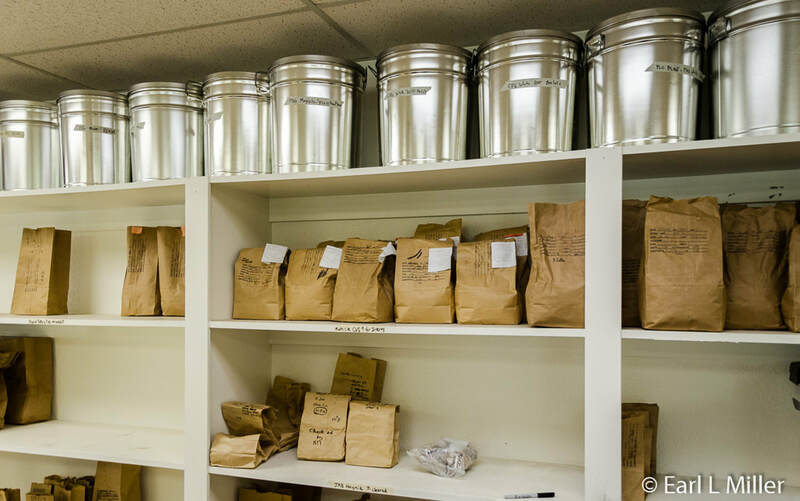 Visitors also see walls of small paper bags whose artifacts have been analyzed on databases. 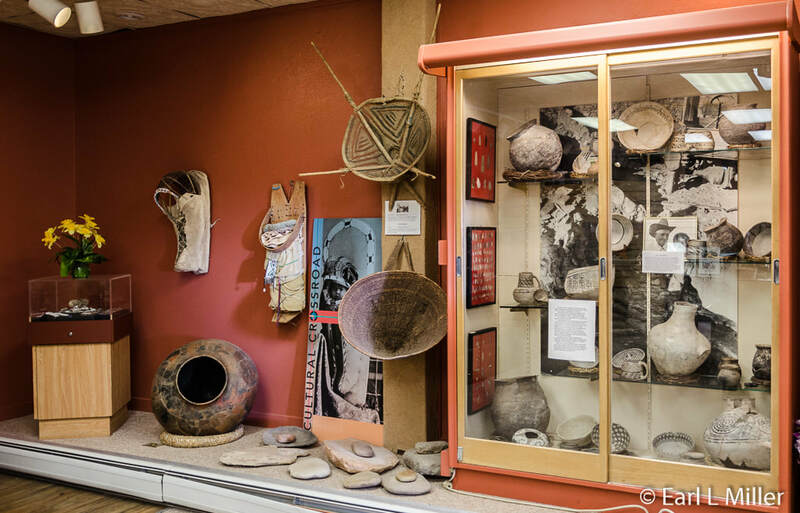 The artifacts then go to the Anasazi Heritage Center in Dolores, Colorado. We learned that the lab uses color test books to identify every color of the pottery. Each color has a different number providing a quantitative description. After the clay and paint colors are matched with a specific number, they are entered, along with the location, into a database. Next she showed us burnt corn and a bone awl. The ancient peoples used awls for piercing animal hides such as deer. They used animal hides for their clothing. The corn might have been found with what was once a hearth. Jeanne described dendro chronology. Take something known, such as cutting down a contemporary tree, and go back and back by counting tree rings dating to 1100 AD. It is a way to date timber cut down in 1124. An advantage of southwestern Colorado is that it’s very dry which means organic material doesn’t decompose. We also saw pins, a stone pendant, and several pieces of corrugated pottery. Corrugation allowed heat to be distributed when the pottery was firing. At Crow Canyon, youngsters learn about firing in a small kiln. Kari Schleher, the lab manager, joined us. Kari showed us pottery, dated around 1100 AD, that came from the Haynie site. Ancestral Pueblo populations used corrugated pottery for cooking, often directly on the fire, and for storage. From this pottery, they have done residue analysis and found stew, corn, and different meats such as rabbit and deer. They have not found as much residue in decorated bowls. Corrugated pottery lets the heat out allowing you to simmer with less boil over and loss of contents. It could be viewed as a prehistoric slow cooker. The pottery we were shown was from different time periods with most being from Pueblo II. Pueblo II, 900 to 1150 AD, had straight rims while Pueblo III, 1150 TO 1350 AD, had flared rims. The Anasazi made brown pottery which was splotchy. Different family groups had different designs, some decorative. Pottery in the Southwest was coiled then indented or smoothed. Occasionally the Puebloans used tools. Archaeologists mostly see fingerprints which means they were hand done instead. We saw one with fingerprints. For painting, the early Basketmakers (1500 BC to 500 AD) used mineral paints. Those in the Pueblo III period boiled down plants and used water-based paints. Most common were the Beeweed and the Tansy Mustard. Brushes were made of yucca. You can tell the difference since with water, the paint soaks in and boundaries are not sharp. 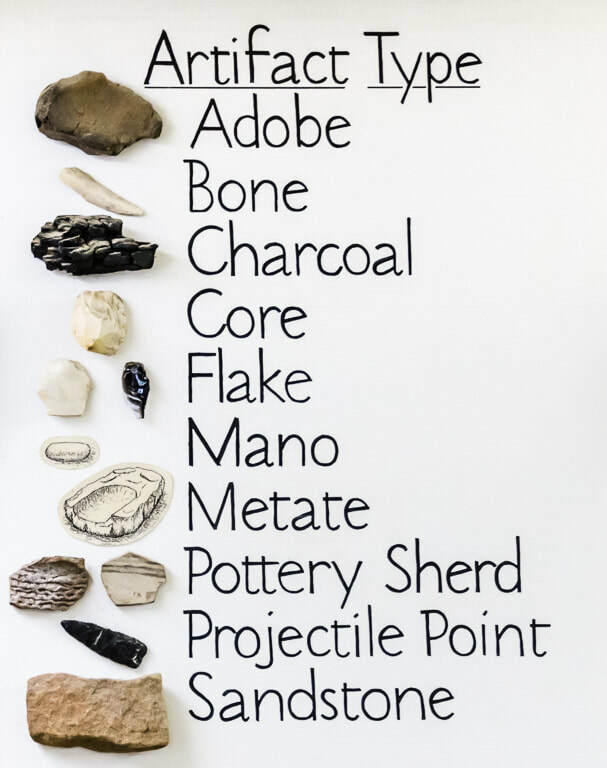 Mineral paints are like oil paints as lines are sharp since the paint sits on top of the surface. Most pots lasted five to ten years, sometimes less. Red pots found in the Mesa Verde area were trade wares since there is no red clay in the area. Going outside on our tour, Jeanne pointed out the dining hall where up to 90 people can be served. Crow Canyon used to accommodate people at the lodge but now visitors stay at new cabins for sleeping or in hogans when they do archaeology for a week. At their Scholar House, visiting scholars stay. 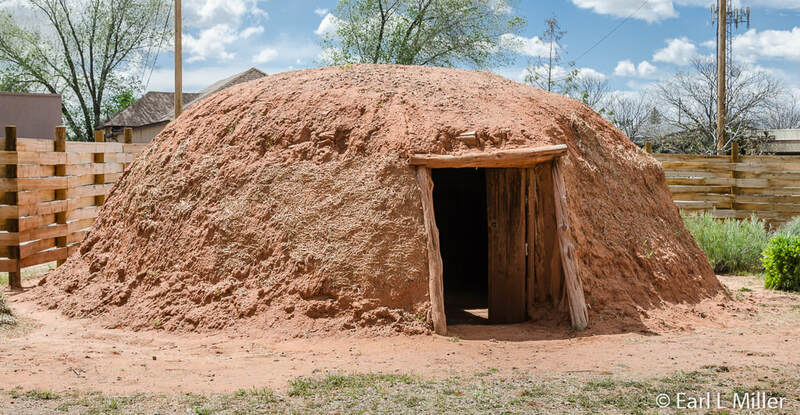 Those taking this tour then hiked to a replica of a 7th-century Pueblo Indian pithouse. Because of the high elevation, we decided to skip this portion. We found the tour fascinating and highly recommend it to anyone before a visit to Mesa Verde, the Anasazi Heritage Center, or any of the area’s other ancient historical sites. It will definitely increase your understanding and appreciation of what you will be seeing. Located at 23390 County Road K, Crow Canyon’s telephone number is (800) 422-8975.